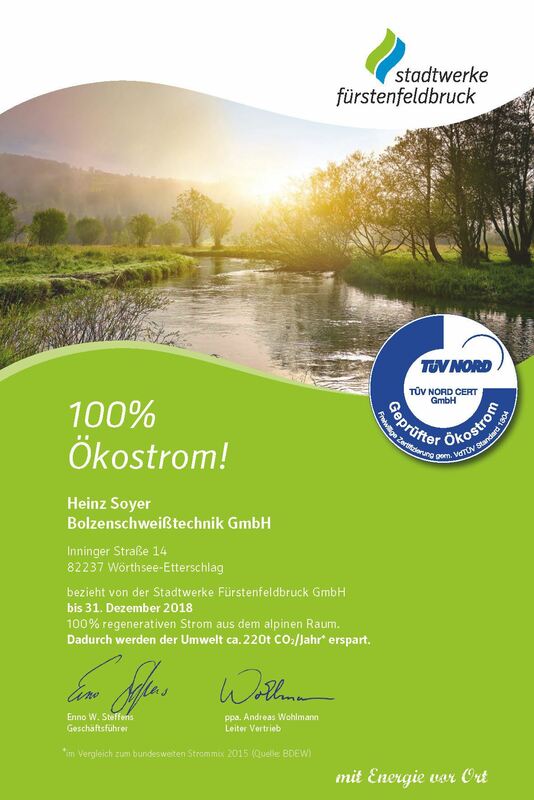 By continuously improving our environmental management system according to DIN EN ISO 14001 : 2015 we strive to minimize the environmental impact caused by us. Up to 70% less energy use due to our SRM technology® while still providing maximum welding performance. We currently purchase 100% of our clean electricity from the Alpine via the municipal utilities of Fürstenfeldbruck. In this way, we achieve CO2 savings of about 220 tons per year for our environment. Click here to view the Green Energy Certificate. Progressive replacement of existing lights with modern LED technology to continuously reduce the energy use. Whenever possible, we cooperate with regional suppliers in order to ensure short transit distances. When choosing our suppliers, an ecologically orientated corporate culture is a key factor. Avoiding before reducing before recycling. This is our concept. Our comprehensive waste separation achieves a maximum recycling rate for the protection of the environment.